Badri A. Younes is NASA’s Deputy Associate Administrator for Space Communications and Navigation (SCaN) and SCaN Program Manager. SCaN is a division of the Human Exploration and Operations Mission Directorate at NASA Headquarters. He is responsible for NASA’s space communications and navigation infrastructure and services, as well as space data standards and spectrum policy. He oversees NASA’s three space communications networks – the Space Network (SN), Near Earth Network (NEN), and Deep Space Network (DSN). 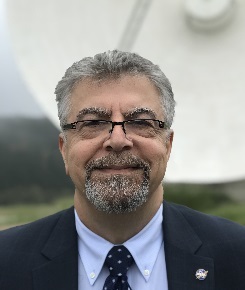 Mr. Younes is also responsible for the development of advanced space communication technology and capabilities critical to meeting the Agency’s vision for an integrated SCaN architecture aligned with NASA’s future space exploration needs. Prior to returning to NASA in 2007, Mr. Younes was the Department of Defense (DoD) Director for Spectrum Management, with responsibility for spectrum policy and strategic planning and implementation. Under his leadership, DoD successfully negotiated major win-win agreements with other US government agencies and the US private sector. Mr. Younes’ experience spans over thirty-three years of leadership in microwave and radiofrequency systems engineering and technology. He holds a Masters in Electronics Engineering from Catholic University of America.